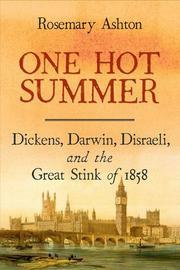 A snapshot of Victorian London during a sweltering season rife with scandals and smells. The “great stink” came from the Thames, into which the city had unwisely been dumping untreated sewage for years. It reached crisis proportions in June 1858, “either the hottest or the second-hottest month on record,” as the temperature peaked at over 100 degrees. The Thames Purification Bill, which laid down broad financial and administrative outlines for cleaning up the river, was one of several controversial acts skillfully maneuvered through a fractious Parliament that summer by Benjamin Disraeli, flagged in the book’s subtitle along with Charles Dickens and Charles Darwin as the putative co-subjects of this rambling narrative by Ashton (Emeritus, English Language and Literature/Univ. Coll. London; Victorian Bloomsbury, 2012, etc.). In fact, the scandal over Dickens’ public separation from his wife and the stir created by the first public reading of Darwin’s ideas on natural selection share space with numerous other topics, including a juicy divorce trial involving his wife’s racy diary; cabinet member Edward Bulwer Lytton’s attempt to dispose of his difficult wife by having her involuntarily confined to an asylum; and a contretemps at the Garrick Club that resulted in the bitter estrangement of Dickens and fellow novelist William Thackeray. Ashton favors a highly episodic approach she calls “microhistory,” which seems to mean rehashing the minute particulars of contemporary periodicals now available digitally; it “can uncover hitherto hidden connections, patterns, and structures,” she asserts, but readers may feel it mostly serves as justification for the author to skip among a plethora of not-particularly-related topics, taking an impressionistic approach to chronology that does not make for clarity. Still, her rather sloppy text is partly redeemed by vivid character sketches and a breezy writing style. History lite, but an agreeable diversion for undemanding general readers.